The Max Burton 6530 ProChef 3000-Watt Commercial Induction Cooktop is a portable, single burner cooktop that is suitable for use in any situation where you need a cooking surface and you have access to an electrical outlet. This unit has 13 different power levels from 500 to 3000 watts and there are 10 temperature settings ranging from 140 to 464°F. You will be able to warm up soups or gently boil water for soft-boiled eggs or use it to rapidly get water to a rolling boil or use it for frying food at higher temperatures. This unit is very versatile. This unit includes some nice safety features such as a cookware detection feature that will automatically detect whether your cookware is compatible with an induction cooktop. There is also a function lock so that you will not accidentally change any settings on the unit during cooking. There is also an overheat sensor and an automatic shutoff protection feature. 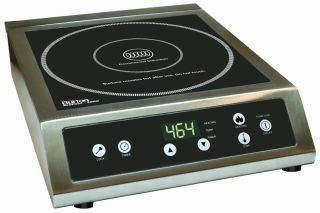 There are not a lot of reviews online for the Max Burton 6530 ProChef 3000-Watt Commercial Induction Cooktop. The only reviews we found online were on Amazon.com and at the time of this writing there were 6 reviews on that site. Unfortunately, this unit received an average user rating of just 3.7 stars which doesn’t sound great but when you look at the breakdown of the reviews it’s really not that bad. There were no 1 star ratings. There was only one 2 star and one 3 star rating. There was also one 5 star rating and three 4 star ratings. With the majority of the reviews being 4 stars things started to look a little better for the Max Burton 6530. I would also like to mention that one of the negative reviews wasn’t even for this particular product. Someone that left a negative review said that they purchased the 1800 watt unit but they left their review on the page for the 3000 watt unit. Since they haven’t even used this particular unit it’s not fair for them to leave a review for it. One complaint that the negative reviewers have was that the 1800 watt power settings are pulsed, meaning that the power turns on and off to maintain the lower temperatures so some users feel that it is not a great unit for slow cooking or for melting chocolate and things like that. The people that left positive reviews said that the Max Burton 6530 is a powerful unit and one customer said that it works well in a commercial environment, they use it in their restaurant. Another customer said that the unit is very well made and is available for a very reasonable price. This person also said that this unit is able to boil water in about 10 seconds. Another customer compared using this unit to using a gas range with a 15,000 BTU burner. They said that their gas range took 5 min. and 45 seconds to boil a half a liter of water and the Max Burton 6530 ProChef 3000-Watt Commercial Induction Cooktop took him a just 1 min. and 30 seconds to do the same job. Although there are not a lot of reviews online at for the Max Burton 6530 ProChef 3000-Watt Commercial Induction Cooktop and a couple of the negative reviews bring the overall average user rating down quite a bit, the reviews for this unit do seem to be pretty strong and it does seem like a good quality unit. We normally like to see more reviews before we give a product our recommendation but the Max Burton 6530 ProChef 3000-Watt Commercial Induction Cooktop does appear to be a safe bet.